When attempting to remodel outdoor areas of the house you may have need of concrete decoratives, such as statues or figurines for your garden. But finding something really unique in home and garden stores is difficult and expensive. There is another option. 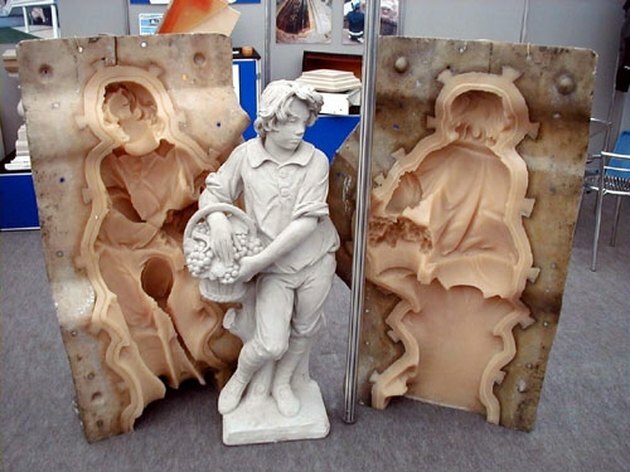 You can make your own concrete mold and use it to produce as many castings as you like for your outdoor projects. This guide will explain how to create and use molds specifically designed for concrete statuary. Seal the pores of the item to be cast in a mold. Use a store bought sealing agent, shellac or paste wax. Use at least two coats and let it dry fifteen minutes between coats. Set it aside to dry. Use the sealing agent again on the inside of the leak proof container. A large Rubbermaid container will work well, though cardboard can be substituted if the mold is very small. Use the release agent on the item and the container. They can be found in hardware stores, usually in a spray can. What you specifically want is an agent that acts on latex and rubber polysulfate. Take your pourable rubber and mix it up in an expendable jug or pale, this should be the PMC-726, the other kind will be used later. It will typically come in the form of a liquid agent and a powdered agent which must be combined before it can solidify. Pour an inch or two of the rubber into the bottom of your container, making sure it’s evenly coated. Wait a few moments for the rubber to develop a slight skin. Press the item to be cast into the rubber, making sure that it does not reach the bottom of the container. Pour the rest of the rubber over the top of the item, covering it completely. Allow to dry for the rest of the day. When the rubber is hardened, remove it from the container. If you coated the walls of the container sufficiently it should slide free. Use your razor to bisect the rubber. By the end you should have two mold halves, allowing you to remove the original statue. Mix up the PMC-790 in the other mixing pail in the same manner as the other rubber. You’ll need a significantly larger amount for this part of the mold. This rubber is much stiffer when dry and will allow your mold halves to stand up and maintain their rigidity while still ensuring that the inner layer of rubber shows as much detail as possible. Pour the PMC-790 liquid rubber equally into two large wooden crates. Place one half of the mold face-up into each; try to keep the mold even with the level of rubber so it will stand as straight as possible. Use the crowbar to break apart the crates once the rubber is completely dry. The two halves should be able to stand upright because of the box of hard rubber surrounding them. Fit the two halves of the mold together and secure them by putting a locking strap around them and cinching it tight. These straps are used for the shipping of fragile objects in trucks and look a bit like a seatbelt with a large steel buckle. Flip the mold over so the foot or bottom of the figurine mold is facing up. At the center of the seam of the two halves, on the top of the mold, use your drill to bore a large hole. The hole should be maybe an inch wide and go all the way through to the core of the mold. Your mold is complete. Spray or apply your water-based concrete releasing agent to the insides of the mold halves. It is necessary in order to remove the concrete items you cast from the mold. Fit the halves back together and use the locking strap to cinch them tight. Mix your cement and pour it into the hole bored into the top of the mold. Agitate and shake the mold after the concrete is poured to pull air bubbles to the surface. This will help prevent air pockets ruining the detail of your finished concrete piece. Let the concrete dry for at least a day before removing from the container and the mold. It should peal away from the mold easily. Use the file to remove any jagged edges or unwanted marks to the finished statue.